Markhouse School Closes – Teenage Theatre Opens! In the period following the re-organisation of Secondary Education in the Borough, and the consequent closure of Markhouse School, there was clearly a good deal of ‘behind the scenes’ discussion taking place about the future use of the premises – with, it would seem, Stan Raynor, the Warden of the nearby Marsh Street Youth Centre, doing his very best to ensure that it would continue to serve the young people of the area – and doing so with obvious success! At what point the decision on the future of the premises is unknown, but when ever this was the actual change of use happened quite ‘seamlessly (a word probably not in the Dictionary at that time) and overnight it became the Markhouse Youth Centre & Education Centre – with the entire upper floor given over to the Drama Club – the ‘strategically’ placed ‘sitting tenants’! 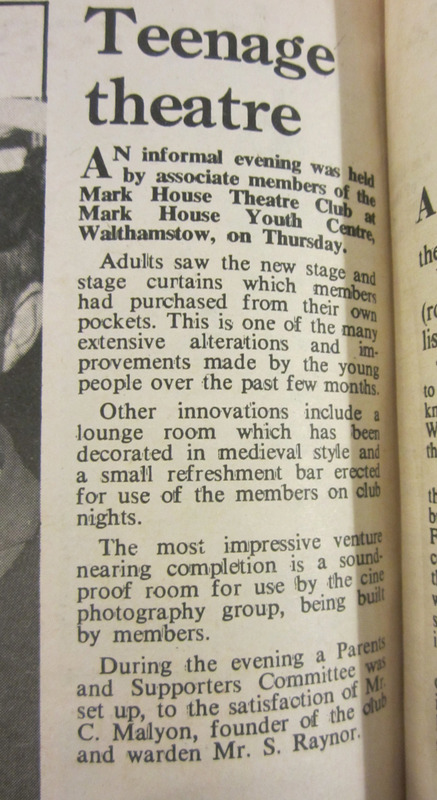 There then followed a rapid period of rebuilding the stage and backstage (former classroom) areas, the creation of a costume room, sound studio and the conversion of the cloakrooms into Scenery Bays – all designed and completed by members – and duly ready in time for a previously unanticipated Christmas Pantomime – Old King Cole! 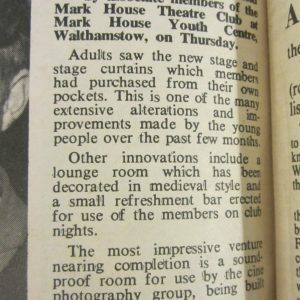 This Report from the Walthamstow Guardian from June 1967 – just a year after the closure and the creation of a ‘Teenage Theatre’, seems appropriate to add into this part of the Drama Club’s timeline – showing that the sad circumstances of the loss of the school and all it had done for its pupils was then turned into something quite positive!